۱۳ ژوئیه ۱۴۰۲ میلادی (۲۴ یاش)? 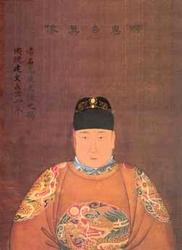 جیان‌ون (اینگیلیسی‌جه: Jianwen Emperor) قدیم چین ایمپیراتورو. ۳۰ ژوئن ۱۳۹۸ – ۱۳ جولای ۱۴۰۲ ایل‌لر آراسیندا حؤکومت ائدیب. هونقوو اؤلوموندن سوْنرا حؤکومتی اله کئچدیب و اؤزونون وفاتیندان سوْنرا یونقلو واریث کیمی تخت و تاجه صاحیب چیخیب. ↑ Supposed to have died in the burning of the Imperial Palace. However, it is widely believed that he survived and lived underground for many more years as a Buddhist monk. ↑ On 30 July 1402 the Jianwen era was officially abolished by the new emperor, and the former هونقوو was reestablished until the beginning of 1403 when the Yongle era officially started. ↑ This name was provided by the خونققوانق, self-proclaimed emperor of the Southern Ming dynasty, in 1644. The full title was "Sìtiān Zhāngdào Chéngyì Yuāngōng Guānwén Yángwǔ Kèrén Dǔxiào Ràng Huángdì" (嗣天章道誠懿淵功觀文揚武克仁篤孝讓皇帝). ↑ This name was provided by the خونققوانق.